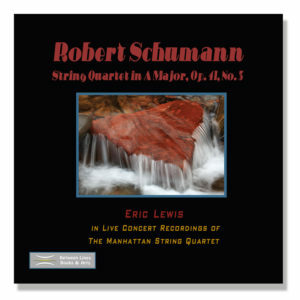 Robert Schumann’s three works for string quartet were created within six weeks between June and July 22, 1842. Of these three Op. 41 quartets written to celebrate his beloved wife Clara Schumann’s birthday, the A major, Op. 41, no. 3 is the most loving and tender. The opening falling fifth intones his wife’s name, Cla-ra, in music; additionally, it generates the themes of the Allegro molto moderato first movement, and it puts forth the even more lyric and expressive second theme played by the cello accompanied with the others in a syncopated, gasping rhythm. The music takes the breath away as Schumann seems to be writing notes where others use words. The quartet is in four movements: 1. Andante espressivo: Allegro molto moderato; 2. Assai agitato (scherzo); 3. Adagio molto; 4. Finale: Allegro molto vivace. String Quartet in A major, op. 41, no. 3 (1842) “Clara”, was played on Aug. 15, 1987, as part of the Dumbarton Avenue Chamber Music Series, in Washington, D.C., by the Manhattan String Quartet with members: Eric Lewis, first violin; Roy Lewis, second violin; John Dexter, viola; and Judith Glyde, cello. This documentary tape of that performance was recorded by Shield Recording of Fairfax, Virginia, and re-mastered by Jonathan Mullen at his studios in Danbury, Connecticut. The concert tape also included one of the MSQ’s favorite encores—Andantino movement from the Forth String Quartet of Dimitri Shostakovich and is included here to close out the CD. The Andantino, in its tenderness and soul-searching humanity for the composer’s beloved Russia, takes in much of the painful history of Russia’s suffering. As a result, it is a statement of musical irony soaked in the ambivalences of Shostakovich’s time. This Washington, D.C. concert followed a period of intense concertizing in the U.S., principally at the MSQ’s Music Mountain radio residency, and in Europe and the Soviet Union. This documentary live tape is included in Between Lines Books & Arts the 50-year performance retrospective of violinist Eric Lewis.